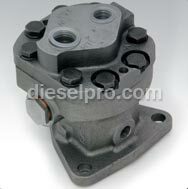 If you are looking for a Detroit Diesel fuel pump for sale, you have come to the right place. These pieces of machinery are vital to your entire engine running smoothly. After all, if an engine cannot get the fuel, it will not be able to run for long. In general, these pumps serve three vital purposes: removing air from the system, cooling the injectors and circulating the fuel. A small problem in this part can quickly lead to larger problems elsewhere, which is why it is very important to replace it at the first sign of needing repair. Luckily, we have a huge selection of pumps, designed for a variety of engines, regardless of arrangement or orientation. Simply select your engine below to get started looking for parts, or look below for more information, including servicing and maintenance. General Information: The pump used is a positive displacement, gear-type pump, and it sits between the fuel tank and the injectors. When you should consider replacing your pump: Engine stalling, excessive leakage around seals or the engine being unable to start are general signs that the pump should be looked at. More specifically, if you open the pump itself and notice the gear teeth worn or chipped, drive gear damaged, relief valve scored or damaged. If you are simply performing an overhaul, then replacing the pump too is a great way to get your engine back to running like it had zero hours on it. Listed below are some procedures and more information divided by engine series, including removing and servicing a pump. Please note that these are intended as a guideline only and all work should be done by a trained Diesel mechanic. Important note for 6V92 and 8V92 engines: The pump cover inlet opening marked L.H. IN must be next to the balance weight cover or blower housing. Step one: Place a new gasket on the pump body mounting flange. Put the drive coupling fork on the square end of the shaft. Step two: Place the fuel pump against the housing. Be sure that the drive coupling fork meets with the drive disc slots. Step three: Using the three nylon patch bolts, attach the pump housing. Step four: Coat the inlet and outlet elbows with gasolia, permatex, or similar non-hardening sealant. Be sure that you do NOT apply any to the first two threads of the fittings. Install the elbows into the pump cover. Step five: Tighten the 1/4 inch fittings to 14 lbs•ft. Tighten the 3/8 inch fittings to 18 to 22 lbs•ft. Tighten the 1/2 inch fittings to 20-25 lbs•ft. Step six: While holding connector block securely, tighten fittings on the filter to cooler plate and cooler plate to fuel pump hoses to 190-200 lbs•inch. Step seven: Connect the inlet and outlet fuel lines to the fuel pump elbows. If a fuel pump drain is used, secure it to the pump body. For the Detroit Diesel 6V92, 8V92, 12V92 and 16V92 engines, the fuel pump will have a fuel return manifold and a fuel return line that goes back to the tank. The pump is attached with three nylon patch bolts. The unit is driven by the drive coupling fork, which is attached to the blower's rotor. These engines always rotate to the left. If you change from a standard capacity pump to a high capacity pump, be sure to use the appropriate fuel lines and connections. The pump will sit on two dowels, and does not require a gasket where the body meets the cover, though a very thin coat of sealant will help with small irregularities. When servicing, you will see three tapped holes. The vent, which should be located on the bottom, should be left open, while the other two should be plugged to prevent damage. Prepare by disconnecting the fuel lines, drain tube and bolts. Then take the pump out of the housing. Step one: With the fuel pump removed, next remove the eight cover bolts to take out the drive shaft, gear, and retaining ball as an assembly. Step two: Once the drive shaft is far enough to remove the steel ball, invert the shaft and gear assembly to press the shaft and gear out of the body. Do NOT remove the gear from the shaft. Step three: Locate the relief valve plug and remove it with the copper gasket. Step four: The valve spring, pin and relief valve can all be removed now. If the seals are bad, then they can be replaced at this step. This can be done by tapping them gently with a hammer. If they are removed for any reason, they have to be replaced with new seals. Do not try to reuse. Step one: To reassemble, first lubricate the oil seal lips with a light coat of vegetable oil. Step two: Put the pump body on wood blocks. Drive the seal into the pump body until it bottoms. Step three: Place the outer seal with the lip of the seal facing down. Drive the seal into the pump body until the set. Step four: Gently clamp the pump body in a soft jawed vice, with the valve cavity up. Lubricate the outside diameter of the valve and place it in the cavity with the hollow end facing up. Step five: Insert the spring into the valve, and the pin into the spring. Step six: Put the new gasket in place next to the head of the valve plug and place the plug over the spring to thread it onto the pump body. Step seven: Tighten the half inch plug to 18-22 lb•ft torque. Step eight: Install the drive gear over the end of the drive shaft and press the gear beyond the retaining ball indent. Step nine: Place the ball in the detent and press the gear back until the slot contacts the ball. Step ten: Lubricate the pump shaft and insert the square end of the shaft into the opening, through the seals. Step eleven: Place the shaft and gear assembly into the pump, lubricate the gears with clean engine oil and apply a thin coat of sealant over the face of the pump cover. Be careful not to apply too much sealant on the pump cover face, due to this area forming a metal to metal seal. Step twelve: Line the holes in the pump up with the two dowel pins. Step thirteen: Secure the cover with the eight bolts by alternating which bolts you tighten to make sure they are tightened evenly. Step fourteen: Rotate the pump by hand to make sure that the parts rotate freely. If it does not, try tapping a corner to free it. This section outlines information about the fuel pump for the Detroit 371, 471 and 671 engines. For the 71 series, the fuel system works by drawing fuel in through the strainer, then through the pipes to the inlet side of the injectors. The fuel pump for this series should have a pressure of 40 to 60 PSI as measured at 1800 RPM. Observing the seals. Fuel leaking out of the seals is normal, but if it exceeds one drop per minute then they should be replaced. If you open the pump, check all of the components for signs of wear, pitting or marks. Be sure to also check the coupling, which connects the pump's shaft to the rest of the engine. If this is damaged then it should be replaced as soon as possible to prevent the engine from shutting down. • First, check the fuel level in the tank and that the supply valve is open. • Check the drive shaft on the pump to see if it is broken. This can be done by putting a wire into the flange holes and cranking the engine to see if the wire vibrates. • The most common problem is the relief valve. This valve can be stuck in place and not pushing fuel into the engine. Step one: Disconnect the fuel tubes from the inlet and outlet openings, along with the drain tube. Step two: Remove the three attaching bolts and seal assemblies. Step one: Place a new gasket in place on the pump body mounting flange. Make sure the drive coupling fork is over the squared end of the drive shaft. The pronged ends of the fork should be directed away from the pump. Step three: Secure the pump to the blower by tightening the three bolts and washer assemblies. Step four: Connect the inlet and outlet tubes. This can result in uneven running or even engine stalling. The first step to take is to check for loose or faulty connections. Check to make sure the fuel pump suction line is connected to the fuel return tube as well. One way to detect an air leak problem is to first bleed the filter content. Operate the engine for 15 to 20 minutes at a relatively high speed. If the filter shell is full when it is loosened from the cover, then there is no leak. If it is only partly full, then there is a leak in the system.